"Big hurdles" make Ezzard "a little pessimistic about health care reform"
ORLANDO, Florida (CNN) -- Blanche and Margaret Dormady bristle at the mention of a stronger federal government hand in their health care. Stafford Ezzard, on the other hand, can live with that. 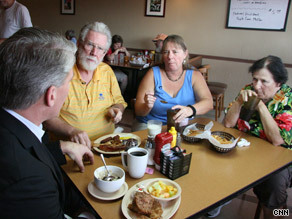 CNN's John King, from left, talks health care with diners Stafford Ezzard and Margaret and Blanche Dormady. "I trust the government more than many people do," said Ezzard, a music teacher. "It will make it worse," Blanche Dormady said without hesitation. At Junior's Diner in Orlando, the raisins added just the right touch to the oatmeal, and the cinnamon muffin was perfect. And a breakfast conversation about health care is a reminder to us -- and to Congress -- that even those who agree that the American health care system needs some serious work are not necessarily on the same page about how to go about the repairs. Margaret Dormady, Blanche's daughter, described herself as a Democrat who votes on issues, not party label. "I'm against national health care," Margaret said. She works as a real estate appraiser and a massage therapist. "I personally don't have health insurance because it is too expensive," she said. "But I want to get for myself what I need. And I don't want to be told what I can have and when I can have it. And I sure as hell -- excuse me -- don't want the government having my medical records running throughout the United States." Blanche Dormady says she worries a bigger government role would eventually lead to a government-controlled health care system with limits on care. "I want to do what I want to do for myself. I don't think the government ought to get into it." Ezzard said a doctor he preferred recently joined a new practice and said he would only continue to take his insurance if he also paid a $1,500 annual fee per family member. "Now I find that very abhorrent that you are going to have medicine where you are provided for very well if you are more wealthy," he said. All three predicted hospitals, insurance companies and drug-makers would use their political power to fight provisions they don't like. And as they discussed the different issues -- and their different perspectives -- Ezzard said: "There are some big hurdles to overcome. That is why I am a little pessimistic about health care reform."